Ella Fitzgerald, the “First Lady of Song,” recorded over 1,100 songs during a career that spanned more than half a century. She sold more than 40 million albums, won 13 Grammy® awards, and performed to adoring fans throughout the world. This year is the centennial of Ella’s birth and celebrations abound in the world of jazz and beyond, paying tribute to her and reminding us all of her contribution to not only jazz, but to popular music of the Western World. Long after her passing in 1996, her musical legacy lives on. From the beginning of her career in the mid-1930s until the mid-1950s she was generally confined to performing in jazz clubs with segregated audiences. Concert halls and upscale venues were out of reach. The upward trajectory of her career had stalled and she was stuck in a niche with a loyal jazz audience at a time when jazz was being overtaken by the popular music of the day – rock n’ roll. Ella had all the qualities needed to succeed but lacked the vision of how she could broaden her audience and overcome the barriers facing an African American jazz singer. 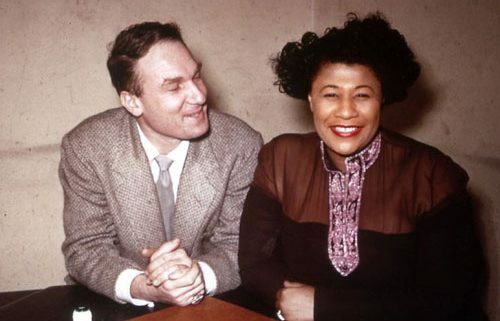 That vision appeared in 1956, when the son of Russian immigrants, Norman Granz, changed the arc of Ella’s career, catapulting her to top of the music world, where she would remain for the rest of her life. Norman was a concert promoter, talent manager, record producer and record label owner. One of the most important figures in the history of jazz, he was an innovator that changed the course of jazz, all the while championing the cause of civil rights. Norman grew up during the Depression and fell in love with jazz. Starting out promoting nightclub shows during WWII he hit upon the idea of taking the jam sessions that regularly took place “after hours” in jazz clubs and presenting them in a concert setting, thereby exposing the brilliance of improvising jazz musicians to a much larger audience. The first concert he presented was in 1944 at the home of the Los Angeles Philharmonic, billing it “Jazz at the Philharmonic” (JATP). The concert was a remarkable success and led Norman to regularly present JATP concerts in L.A. and quickly thereafter, throughout the U.S. (but not the segregated South), and then touring internationally. Not bad for a 25-year-old jazz fan. In addition to presenting unique programing, he understood the draw of the jam session and recorded the performances, thereby expanding the audience and building the JATP brand. By the 1950s, Norman’s meteoric rise as a concert promoter allowed him to build relationships with some of the most important jazz musicians of the era. Norman knew the sting of prejudice personally, having had an African American girlfriend. He was totally dedicated to not only presenting jazz but integrating the audience while elevating the genre from smoke-filled clubs to concert halls throughout the world. It is hard to believe today, but even after WWII, audiences were still segregated in the U.S. Norman vowed to change that and he did by requiring venue operators to allow an integrated audience when the musicians he managed and the concerts he promoted were presented in their venues. Ella toured with JATP and Norman wanted to manage her since he had a vision of how he could advance her career, not only broadening her audience but also elevating the venues she would perform in. She was hesitant, but Norman was very persistent and he offered to manage her for no fee and give her the right to terminate their relationship at any time. Ella reluctantly agreed in 1955, although she insisted that she pay his customary management fee. Years later, Norman confirmed that he never had a signed contract with Ella during their 40-year relationship, explaining that each had the right to terminate their relationship if either was unhappy. Shortly after becoming Ella’s manager, Norman was able to extract Ella from her recording contract with Decca and signed her to his new record label, Verve. The catalog of Verve grew as jazz greats including Charlie Parker, Bill Evans, Stan Getz, Billie Holiday, Oscar Peterson, Ben Webster and Lester Young were added to the label. With Ella’s signing to Verve, Norman relaunched her career, taking her from a cult figure loved by jazz enthusiasts to the top of the world of pop music, while presenting her in a way that did not offend her hard-core jazz fans. How did he do it? Norman’s vision was for Ella to celebrate the Great American Songbook and she did in a series of eight recordings in eight years. Starting with “Ella Fitzgerald Sings the Cole Porter Songbook” in 1956, Ella followed with tributes to Rogers and Hart, Duke Ellington, Irving Berlin, the Gershwins, Harold Arlen, Jerome Kern and Johnny Mercer. These recordings were artistically brilliant and commercially a bonanza. They confirmed that Ella was indeed “the First Lady of Song.” Asked about Ella’s Songbooks, Ira Gershwin was quoted as saying: “I never knew how good our songs were until I heard Ella Fitzgerald sing them.” The rest of the world agreed and Ella never looked back. At 6:30 and 9 p.m. on July 26 at the Sonnenalp Hotel and at 6 p.m. on July 27 in the Jazz Tent in Lionshead, Vail Jazz presents Carmen Bradford and Byron Stripling in a tribute to Ella and Louis Armstrong, and their three great albums celebrating the American Songbook. Happy 100th birthday, Ella!